Chili. Cheese. Pasta. Bring ‘em on! And this dish does, in delicious combination. It’s a quick-bake casserole that makes a perfect cold-weather meal. It even gives you an excuse to use leftover chili. You can have this dish on the table in about 30 minutes, so it’s great for weeknight dinners. But it’s tasty enough for company, too. So take this along to your next pot-luck event. Like maybe your neighbor’s annual Super Bowl party. Who cares which team wins the game? You’ve won the meal. Don’t have chili on hand? No worries – we’ll tell you how to make a quicky version (see the Notes). Prep time for this dish is about 15 minutes, assuming you have chili on hand. Baking time adds another 10 to 15 minutes. So plan on half an hour from start to finish. This dish will serve 4 hearty appetites. Leftovers keep well for a few days if refrigerated in an airtight container. Fill a large soup pot or saucepan with water (use one that holds at least 4 quarts). Bring the water to a boil. When the water is boiling, add the kosher salt to season it. Add the pasta, and cook until al dente (see package instructions – this usually takes 7 to 9 minutes). Meanwhile, grate the cheese and set it aside. Grease a 2-quart baking dish with the butter or oil. When the pasta is done, drain it into a colander or strainer. Pour the drained pasta back into the cooking pot. Add the chili (from Step 2) to the pasta, then stir to combine. Add about half the grated cheese and stir again to combine. Scrape the chili/pasta mixture into the greased casserole dish. Using a spatula or spoon, smooth the top. Cover the mixture evenly with the rest of the grated cheese. Place the baking dish in the preheated oven, and bake until the cheese is nicely melted and beginning to brown (10 minutes should do it, 15 tops). If you want to fully brown the cheese, you can run the dish under the broiler for the last 2 or 3 minutes of baking. When the casserole is done, remove it from the oven and let it sit for 5 minutes so the juices have time to be absorbed into the pasta. Use this time to dice or slice some jalapeño peppers for garnish (if using). Dish up the chili mac and add the garnish, if using. Enjoy! Many recipes for Chili Mac direct you to make chili as part of the recipe. That works OK, but those recipes take longer to prepare. And the chili may not be the best, since it doesn’t cook for long. So we always use leftover chili when we make this dish. 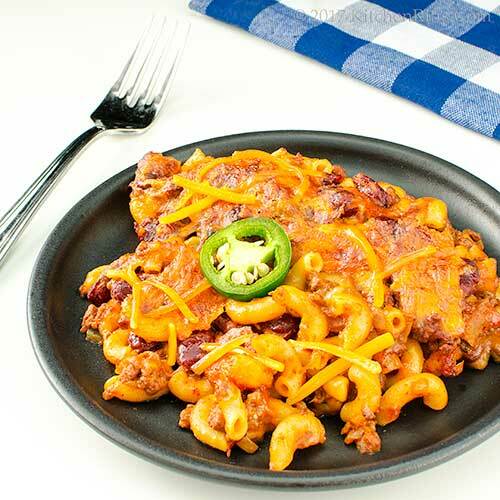 We like to use sharp cheddar cheese for this chili mac, but mild or medium works well too. Or you could substitute another cheese, if you like. Use whatever you think will go well with chili (we’d suggest Monterey Jack). We like to use regular elbow pasta (i.e., macaroni) in this dish. But any small-shape pasta works. Shells might be a fun variation. Or corkscrews. 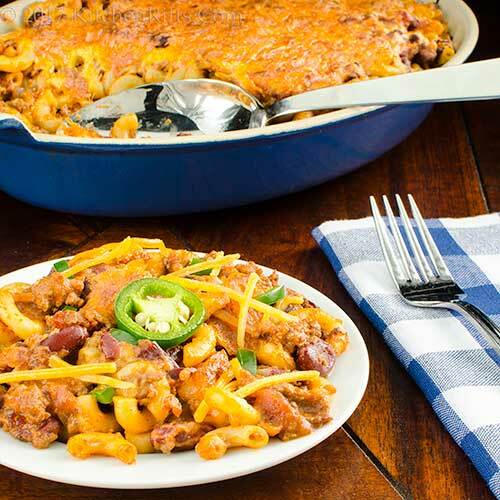 You can easily double the size of this chili mac recipe if you’re serving a crowd. In that case, you’ll want to use a larger baking dish. A 9x13-inch Pyrex dish would be perfect. Beef chili tastes great in this dish, but almost any chili will work. We haven’t tried pork chili, but the idea sounds good to us. We use jalapeño peppers as a garnish in this recipe, but you could mix them into the chili, too. Or substitute a milder pepper if you don’t want too much heat. Indeed. I can’t appeal that ruling. Oh how I wish I could cook and eat high-calorie things like that with a clear conscience! Hi Mae, we shouldn't. But (obviously) we do! Occasionally -- that's the key. :-) Thanks for the comment. I always love to make extra chilli because we love LEFTOVER!! This is another great way to use them. It looks really comforting and moreish! Hi Angie, leftover chili is a treasure, isn't it? We usually just heat it and serve as-is, but it's also fun to use it as an ingredient in another dish. Thanks for the comment. This is definitely mac and cheese kicked up several notches! Hi Sue, yup! And really good notches. :-) Thanks for the comment. Hi Greg, this is already a guilty pleasure type of dish. That'd take this into uncharted territory. :-) Delish, territory, though! Thanks for the comment. This is serious comfort food! I love that it is pretty easy to make too. Hi Laura, this definitely is serious comfort food! Not something we have very often (maybe once a decade!) but always fun when we do. Thanks for the comment. Hi John, We love leftovers, especially chili. What a great way to repurpose. When we are in Oregon we volunteer on the hiking trails, sometimes after we all get together we have the best pot-lucks, casseroles rule. Hi Cheri, we always make big batches of chili simply because we love having a supply of it in the freezer. And casseroles are wonderful for pot-lucks, aren't they? Love those Oregon trails -- so pretty. Thanks for the comment. I love chili Mac! First time I ever had it was at Steak n Shake as a kid. Yours looks great! Oh my! On this rainy cold day this casserole would be perfect! All I need is leftover chili, which always tastes better after the flavor have had time to mingle. I'm smitten with this beautiful dish of pure comfort food! I can't believe I've never made Chili Mac and Cheese - so thank you so much for the recipe! A real comfort meal for my family. We do not do chili a lot in my home, shame on me I know but this is about to change :). Loved your recipe. Hi Vicki, chili mac is real kiddie food, isn't it? And we're big kids! :-) Thanks for the comment. Hi Deb, leftover chili really is a bit better, isn't it? That's why we always make big batches of the stuff! Thanks for the comment. Hi Mary, cheddar cheese has such a wonderful flavor! We love it! And chili, of course. :-) Thanks for the comment. Hi Tricia, this is a fun dish -- you'll love making it! Too hefty to make too often, but fun for an occasional treat. :-) Thanks for the comment. Hi Amira, the best thing about chili is you can make it anywhere from very mild to very hot, and it'll still have good flavor. Thanks for the comment. The Hubs has an aversion to casseroles from his own childhood memories. I think he might enjoy this one though. Delish! Wow, chilli mac, I have never heard of this, John, but gee it sounds fab. My Peter will love it. Many thanks! Hi Debra, call a casserole a gratin and you can get away with anything. :-) Thanks for the comment. Hi Liz, I think this is probably a US thing. A fun dish -- you'll have a good time with this! Thanks for the comment. Hi Merryn, there were TONS of casseroles in my childhood. And many of them not that good, alas. But the good ones were really good! And yes, I am a bit jalapeno-obsessed, I guess. :-) Thanks for the comment. It's like worlds are COLLIDING over here!!! YUMMMMMMY! Hi GiGi, we're all for yummy collisions. :-) Thanks for the comment. There can never be to much chili in our house. In fact, I think my husband's mother made something very similar to this. What a classic. It will never go out of style. Perfect for game day! Hi Abbe, yup, never too much chili for us, either. We're chili fanatics! And this is such a fun dish, isn't it? Not to mention tasty. :-) Thanks for the comment. you know it's past 7pm and I have not had dinner yet and I have nothing at home to make this now, darn you ;-) This looks really good and I should get it on the table this week. Great fusion dish! Hi Evelyne, you'll have to get to the grocery store so you can make this! It's a fun dish -- and really good. :-) Thanks for the comment. This is a great substitute for the 'boring old' Mac and Cheese dish. I must now try your recipe for 'Green Chile Cauliflower and Cheese'- sounds exotic! Hi Fran, yup, this is mac 'n cheese that's really kicked up! That Green Chile Cauliflower and Cheese dish is excellent -- you'll like. Thanks for the comment. My family loves chili mac! One of our regulars around here. Love your version. Hi Karen, isn't chili mac good? We need to start having it more than once a decade. :-) Thanks for the comment. I just realized that I've never made chili-mac casserole before. I guess it's time I do! It looks tasty. Hi Pam, this is a fun dish -- definitely worth trying. Loads of flavor. :-) Thanks for the comment. I love cheesy casseroles in the winter! And yes, perfect game day food here! We always seem to have leftover chili. I'm still cooking for 5 even though 2 have left the nest! 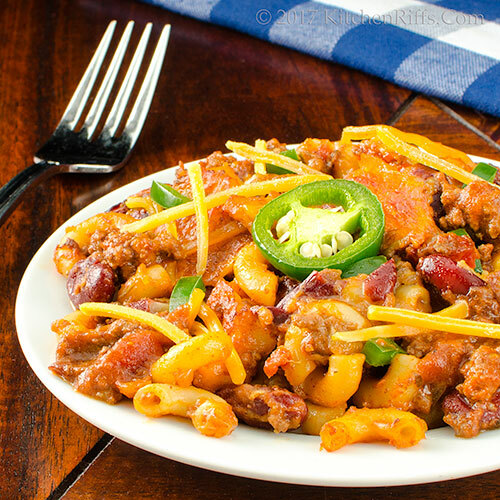 This chili mac would be perfect for game day!!! Hi Ashley, casseroles are comfort food, so they're also winter food! Thanks for the comment. Hi Liz, we tend to make way too much too. But that's OK when it comes to chili -- it freezes really well, so it's always nice to have a quick meal in the freezer. Or to make into this. :-) Thanks for the comment. We never seem to have leftover chilli, but now I am thinking I should hide some before serving so i can have leftover for this dish! Great dish for any day one needs comfort food. Hi Ansh, we make big batches of chili, so we do have leftovers. Good idea to hide some of the chili so you can make this dish. :-) Thanks for the comment. Holy moly! 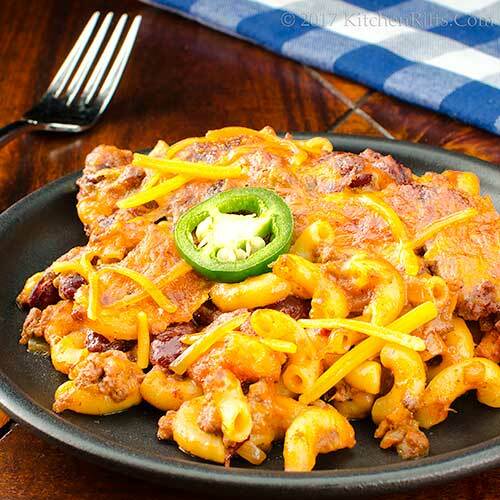 My mouth is watering thinking about such a smart combination of 2 American classic dishes: Mac and cheese and chili. Hi Denise, it's a fun dish! Really good stuff. :-) Thanks for the comment. You are so right! Chili, cheese and pasta! YUM!! Love these hearty meal in one dishes! This one is perfect for the storm moving in tomorrow. Hi MJ, great combo of flavors, isn't it? Stormy weather demands comfort food, and this would certainly fit. :-) Thanks for the comment. I love a great casserole, John, for so many reasons. It's comfort food, it's easy to make and leftovers are the best! This is definitely something that will be made in our house. Believe it or not, chili mac is not a thing up here in Canada - at least not as far as I know but I'm going to make it with some turkey chili I have in the freezer. I hope that's allowed, lol. Always enjoy your posts! I love dishes like these that "recycle" leftovers. Not only do they appeal to my frugal side, they're often even more delicious than the original. Hi Robyn, I'll bet turkey chili would be terrific in this! Any kind of meaty chili works. Enjoy! Thanks for the comment. Hi Frank, recycled leftovers can be so good, can't they? And they are wonderful in this dish! Thanks for the comment. I could DEFINITELY eat this for my dinner tonight; it sounds so good. Hi Carolyn, this is a great dish! You'd enjoy it. :-) Thanks for the comment. This is mac on steroids! If I get to make your cabbage chili I'll make sure to save some for this casserole! Hi Yi, the cabbage chili might be fun in this dish! Thanks for the comment. Hi Anu, the flavor of this really is amazing. Worth trying. :-) Thanks for the comment. Loving this robust dish! It looks amazing. HiTaruna, robust is exactly the word to describe this dish! Well, and good, of course. :-) Thanks for the comment. Hi Judy, this is definitely a "stretch" dish. A good one, though. :-) Thanks for the comment. Hi Charlie, it's a fun dish, isn't it? And I"ll bet your little guy really would enjoy this -- SO much flavor! Thanks for the comment. This looks SO good. And if casserole-crazed is a thing, I'm in all the way! Hi Beth, we're in, too. :-) Thanks for the comment. Hi Carolyn, I've never actually used Hamburger Helper! Should probably try it sometime just to see what it's all about. Or not. :-) Thanks for the comment. This looks like the perfect dish for a Superbowl party or potluck. I'm sure it would disappear in a flash. Hi Pamela, the batch we made sure disappeared in a hurry! It was very tasty. :-) Thanks for the comment. I agree with you gratins are perfect for all family and for these winter weekend gathering! I love your twist on the classic! Hi Katerina, gratins are so good, aren't they? Such a nice, homey dish. :-) Thanks for the comment. This definitely wins the meal! It's exactly right for chilly weather comfort food. Hi Lisa, always good to win the meal, isn't it? :-) Thanks for the comment. This is full-on comfort food deliciousness! Hi Amy, it is! And who can't use comfort food? :-) Thanks for the comment. I love the idea of transforming leftover chili into this comfort dish...cheese and all gooey...perfect comfort food. Hi Juliana, such a nice dish, isn't it? Wonderful comfort food! Thanks for the comment. i've nevr heard of chili mac! I would have no problem eating uplefover chili as-is, but this is a great way to mix it up and stretch it out. Hi Jeff, you'll love this dish! Agree that leftover chili is good all by itself, but this is a fun dish to try from time to time. Thanks for the comment. Hi Ola, yup, it doesn't get any more comforting than this! :-) Thanks for the comment. Mmmmm seriously, this is the perfect excuse to make chilli (which is really long overdue here). This looks like the perfect comfort food and the best for these last cold days of winter! Hi Jamie, this is such a fun dish! We love leftover chili just the way it already is, but sometimes it's fun to play with. :-) Thanks for the comment.